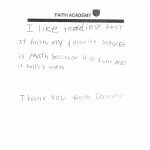 We are so grateful for all your contributions to Faith Academy that makes Christ-Centered education affordable to all. Please pray for God to lead you in your giving. Additionally, Faith Academy partners with Johnson County Community Foundation with an endowment fund. Direct contributions can be made by clicking the “Donate Now” link below. Our Sponsorship Program gives the broader community in Iowa City and beyond an opportunity to serve scholars through financial support and the cultivation of relationships. Faith Academy is grateful for the donors from individuals, businesses and our partners. In order to keep Faith Academy affordable for families, the fair share tuition at Faith is based on a family’s ability to pay. With most of our families coming from low-income homes, more than 90% of the cost of education is covered by our Partners. Through the partnership with the Community Foundation of Johnson County, two funds are available for donations. Donation receives a 25% Iowa tax credit, in addition to federal tax benefits for which you may qualify. 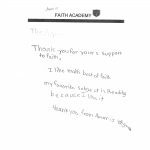 The Faith Academy endowment fund provides a 5% distribution to Faith Academy on an annual basis, so, as the endowment grows, the distribution to Faith also grows. The Faith Academy Charitable Giving Fund allows Faith to request a distribution of these funds at any time to support the operational budget of Faith Academy. The Foundation will charge a minimal distribution fee when the funds are requested. Faith Academy is grateful for the partnership with the Community Foundation of Johnson County and happy to provide you with additional options to support our school! To donate to Faith Academy through the Community Foundation, go to www.communityfoundationofjohnsoncounty.org/give/giving-opportunities and choose Faith Academy Charitable Giving Fund or Faith Academy Endowment Fund.